I grew up in Alaska. We moved there in 1958 when Alaska was still a territory. I got into dog mushing in the Junior Alaska Sled Dog Racing Association at age nine. We returned to the lower 48 when I was in high school. I married a girl from Wenatchee, Washington who I met in college in Nashville, TN. Throughout our years, we always had at least one dachshund and one husky. We lived in the Nashville, TN area for about 35 years. In 2001, while vacationing in Leavenworth, WA, we took a mushing “tour” with Perry Solmonson. Once back on the runners, I never got off. That’s when I started building my small team in Tennessee. I spent 28 years in the army, retired in 2011, and in 2013, moved to my wife’s hometown of Wenatchee. We also needed to be near her 86 year old mother who lives in a retirement center nearby. My kennel is really small now and is solely recreational. My dogs are all Siberian huskies. They are great dogs, wonderful pets, but mediocre sled dogs. 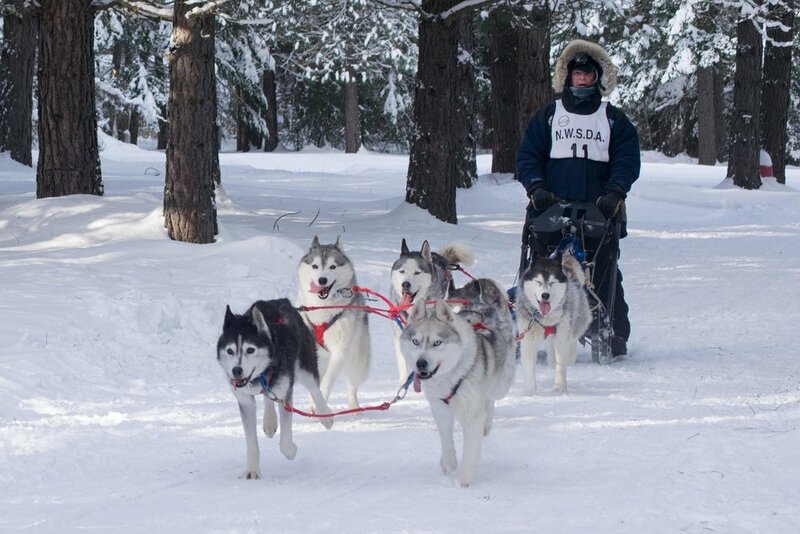 That is alright as our goal in races and mushing is to simply have fun and enjoy the experience. I have two dogs I raised from puppies. Other than that, they are either rescue or re-homed dogs. The person who helped me get started was Natalie Norris. She took me “under her wing” so to speak. She would take me to the junior meetings, helped me with dogs, and equipment. My first race was the one dog class at age nine.. I raced junior races up through high school. Some of my competitors were Rick Mackey and one of the Redington boys. When I think of my “first experience,” I have to move beyond the one dog experience. When I got in the three dog class we actually went out the chute and into the woods for about a three mile race. It was called “Tozier Track” on Tudor Road in Anchorage, AK. When I was eleven, in the Junior Fur Rendezvous, I came in second to Tim Redington, Joe, Sr.’s third son. But the real race was between a girl and me for second and third place. I beat her out over three days total elapsed time by two seconds. That was 54 years ago, but I remember it like it was yesterday. Spidey, my lead dog is the most intelligent dog I have ever owned. She ran two Iditarods as a lead dog in her younger years for Karen Ramstead. I got her from Karen. She is now 14 and supposedly retired from running, but still wants to go. So she has been running with the team some this year. Kalija is four years old and running lead (having been trained by Spidey). He is beautiful little boy with a lot of drive. Kiki is now 11. I got her when she was about five. Knik and Kiana I raised from puppies and are five years old now. Kaboni is six and my most photogenic dog. Finally, Koyuk, a rescue dog, is about nine years old. He has a lame hip and doesn’t run anymore. What I enjoy most is interacting with them apart from running as a team. I have always loved to feed my dogs. In the summer, I sit on a log under a shade tree and let them simply lie around me. They get tummy rubs, ear rubs and scratches and in return, I get sloppy kisses. I enjoy them in the house around my feet as I work on my computer. Sometimes I put them in their dog boxes on the dog truck and let them ride around town while I run errands. I just enjoy being with them no matter what we do. My training regimen lacks a lot to be desired. We live in a mountain canyon. Our road is steep . . . both ways. From our house to the top and back is 3.2 miles. My first runs each season are about a mile. The purpose is to get them mentally back in the game. Then we move to two miles and finally 3.2 miles. It is a steep climb up which is good for muscle building. I use an ATV for this initial training. Then I truck them to a trail and we use a Risdon Rig. At this point, I work for distance. When snow comes, we run at Fish lake Sno-park, usually anywhere from six miles to 12 or 13. When we get snow and can run longer runs, we usually keep it within 1 1/2 to 2 hours. It is 55 miles one way, so we have to manage our time based on the commute. My dogs have it made in the off season. They have full run of our back yard, which is about 3/4 acre. At night, they go to their pens (two dogs to a pen). When it gets hot (and it does in Wenatchee), they have an air conditioned dog room with two doggy doors. In the mornings, after breakfast, I sit on a log under a shade tree and we spend about an hour together. Winter or summer, the dogs have my undivided attention for about the first hour and a half each day, winter, spring, summer, or fall. Running the 2008 Iditarod Trail Sled Dog Race. “It was the best of times; it was the worst of times." Love your dogs with all your heart, soul, mind, and spirit. Their love is unconditional regardless how good or bad a musher you may be. Love them unconditionally regardless of how good or bad a sled dog they may be. Once in your home, keep them for life, and when they breathe their last breath, I pray they do it in your arms.